I think that selling our house, buying a new one, and moving was one of the most stressful things I’ve ever done in my life. That was just me, never mind the stress on the pets. I did anticipate how bad it might be for them, and there was a product I knew I wanted to try to help them through it – Calming Collars. I had read about them on other blogs and saw them on Facebook, and they sounded promising. With two nervous and one reactive dog, we can use all the help we can get. Cricket had done well on all natural anxiety relief pills, but they didn’t do much for Luke or Sheba. I prefer to use all natural solutions for these issues whenever possible, I don’t like to turn to drugs unless we have to and we’re not to that point yet. Calming Collars are based on aromatherapy; they are made from stylish fabrics that are filled with safe, quality herbs made to relieve many issues such as excessive barking, hyperactivity, stress, and anxiety or fears from things such as noises, storms and separation anxiety. I was initially impressed with many things about this product. Each collar is custom made in the USA, to order. That means the calming herbs that are inside it are fresh, they haven’t been sitting on a shelf somewhere for months before being sold. They usually ship within a week, and we received ours within that time frame. Since I am always thinking of things at the last minute, that was great, because we got them in plenty of time for our move. The collars come in two different blends, Good to Go for car sickness, and Calm Me Down for anxiety issues. They also have a Too Cool collar which is filled with polymer crystals to keep your pet cool. It is suggested to put these collars on ahead of time when possible (or it may take a bit longer to work), so I put them on the dogs the morning before we were going to start packing up our final belongings to move. This meant many strangers (to Luke) in the house, and that the dogs and Sam had to be kept safely separate from all the activity, which does not make them happy. The last day of playing in our old yard! Getting ready for the commotion to come. To be honest, the collars didn’t make the dogs completely calm, but I didn’t really expect them to. I don’t have anything to compare this situation to, since we’ve never moved with dogs before, but overall I think they did well. I actually saw Luke just lying in the doorway after the trucks were loaded, watching the Dadz and other men talking in the driveway. Even as they moved around he did not jump up to bark unless someone got real close; and that is good for him. These two sleep comfortably in their collars on our last night in our old home. I kept the collars on the dogs that night as we slept in our mostly empty house, and when they went to Auntie Lynn’s the next day while we were at our closings. Cricket does not like riding in the car, and bad (or totally stressed) Momz that I am, I lost track of her pills during the commotion of packing. She fell asleep in the car! They were all completely comfortable with their collars on. One other thing I was concerned about was how the collars, which have two channels of herbs, would fit on with their other collars which has their ID. It was not a problem! The collars are also adjustable for a proper fit. You can see the two channels here and how it fits fine with Luke’s other collar. The only issue I had with fit was with Cricket’s. She was at the top of her measurement, and I maybe should have gone a size up. Hers did fall off a couple of times because I couldn’t quite tighten it enough to stay secure. She has unusually thick fur around her neck in the winter. Cricket zonked out on our first night in our new home. By day three when we were cleaning out the new house (we bought it with contents), and moving our furniture off the truck in, the dogs didn’t do quite as well even with their collars still on. Well, actually the girls did OK but Luke got a little snarly and crabby with his sisters. But let’s face it, after three days of stress it was asking a lot for a reactive dog like him to still be calm. He was fine after we separated them. Resting comfortably even right after a storm. I’d still like to try them during a longer storm before I’m 100% convinced, but I am very hopeful about it. The great thing about these collars is that they come with a money back guarantee. My thought on all natural remedies like these is that they sometimes work for some dogs, but not others. But if you peruse the company’s website and Facebook page you will see that they have a lot of satisfied customers. One of my favorite things about these? They smell so good! When I left Luke’s on overnight, as I rolled over in bed and hugged him, I could smell the collar and it was not at all cloying, but very pleasant. The scent even lingers a bit on their fur after taking the collar off. Plus, Luke just loves his. He gets all excited when I get it out! 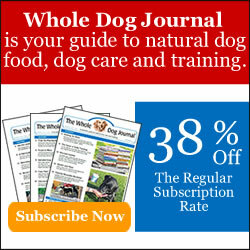 They come in one or two channels as well as extra wide (4 channels – best for cooling collar). If worn constantly, these collars will stay fresh for about 3-4 months. For occasional use they should last about a year. They are also made for cats! We received one for Samantha but I was a bad Mom again and didn’t get it on her for the move. She is not used to wearing collars, but when I did try it on her later, she scratched at it for a minute but then settled down. Sam is a pretty calm cat anyway, but I plan to try it on her when brushing her and trimming her nails, which she doesn’t like much. She did at least relax while stuck in her crate! I will try to remember to report back once I’ve done that, and once I see how it works for the dogs during a thunderstorm. If spring ever really gets here we just might get one of those! *Disclaimer: We received a Calm Me Down collar for each of the pets in exchange for our honest review. We were in no other way compensated for this post; Wag ‘n Woof Pets only shares products we believe will be of interest to our readers, and all reviews are our own honest opinions. Interesting. Do they make calming body suits? I’d love to buy one for Jax LOL My little maniac! I’m sure I told you this, but they say the three most stressful things you can do in life is…get married, have a baby and buy/sell a house. It is SO stressful. I’m pleased to hear your review of these collars, as you know, Sampson has been having some separation anxiety and recently become sensitive to noise. I’ve been giving him calming chews, which are natural and seem to help, but I like the idea of the collar too. I do remember getting married was stressful, but I still think this was worse. I’m glad I passed on having a baby, two of the most stressful things was enough for me – LOL. Maybe if you add the collar to giving Sampson a chew, the two things together might work even better. I wish they made one for fleas and ticks!! Thanks for the information on this. I’ve used the adaptil collar and that works good. Sounds like the collars took the edge off their nervousness. I’ve read good reviews about some of the pheromone collars too. I’m glad it seemed to work so well! Barley hasn’t responded well to any natural remedies, but we might have to give a cooling collar a try this summer! Interesting. We tried something similar for a cat a while back, but it didn’t do much. Maybe it does work better for dogs. We’ve tried calming collars…but a different brand. These are way more stylish, so we might check these out. Though honestly, we don’t know if they made that much of a difference or not. I need to check this out for Rita. We’re going on a road trip in Sept and she keeps getting worse with her car anxiety on long trips. (No idea why – it’s not like anything bad ever happened in the car, and she still loves to ride along on short trips.) Might wait and buy one closer to our trip though – now I just have to remember! Hmmm… I’m going to check these out. I’ve tried just about everything else for Rudy’s storm anxiety. So far the only thing that helps at all is an herbal dog treat. That’s an interesting idea, I actually tried a collar for my kitty but it didn’t seem to work. We’ve now got him a on zylkene an all natural drug that is supposed to increase the serotonin/feel good chemicals in his brain and decrease the aggression issues he’s been having towards my other cat. I’ll keep these in mind though if I think Dante and Ziva need help when we move. I’m going to try this on malakai, he has a lot of anxiety about just about everything, so far we have not found anything that really works. Did the calming cap not work for the grooming? Let me know if you try this and how you make out – good luck! I’ve used lavender oil on my pillow to help me sleep. So I don’t see why similar things wouldn’t do well for dogs. BTW, if Sam doesn’t appreciate collars, you might want to pair the calming collar with something she does like before you clip her nails. Otherwise, you might accidentally negatively reinforce the collar. Thank you for that tip, Pamela! It definitely makes sense, and the last thing I want to do is make her hate the collar. I love the look of those collars. If it can help, I say go for it! The cooling collar would be great down here.